Tampa Catholic is pleased to announce an exciting new service for our students. Mrs. Caroline Shugart will be available daily in the Learning Lab during all lunch periods to tutor students in math. This service is in addition to our normal tutoring time after school with the class room teachers. Students will simply need to eat lunch and sign out at the Dean’s desk in the Cafeteria to take advantage of this opportunity. We are pleased to welcome Mrs. Shugart in her new role at Tampa Catholic. 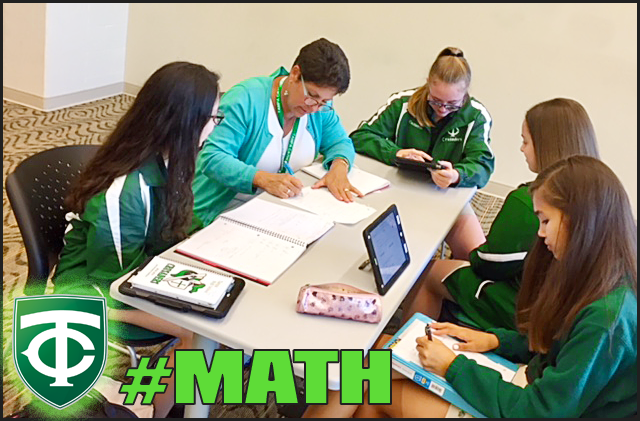 She has been serving as a math and SAT/ACT tutor for the past 11 years throughout Hillsborough County. Mrs. Shugart will be in the Learning Lab daily from 10:30-3:30. “I am excited to provide tutoring to students during their school day!” said Ms. Shugart who will also be working collaboratively with our in-classroom teachers to best serve our students’ education. Her past experiences have given her exposure to students with a wide range of learning styles, capabilities, and backgrounds. She has spent time tutoring homeless students for Hillsborough County Public Schools and helped students with their work in many different academic subjects, including preparing for the SAT, ACT and PERT tests.